Why is it important to scan the subsurface for underground utilities before starting a construction project? This large medical university, as well as Florida-based power company knows that “As Builts” doesn’t always reveal all utilities hidden underneath. The “as-builts”, submitted by the contractors, not only showed a high voltage (230 KV) line emanating directly from the building – it was also cooled with a dielectric fluid containing hazardous materials. A geotechnical firm was brought in to perform borings. To avoid causing damage to any buried utilities they had to begin by scanning the ground to collect vital information about the subsurface. 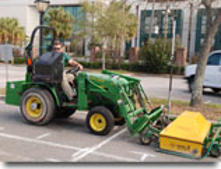 Since EM, the conventional method for ground scanning, was rendered ineffective, the solution was to use Ground penetrating radar. Data was collected from a prescribed grid, that covered the entire area. A line, 45 degrees from the building, could be designated and a geotechnical boring stake was placed exactly over the line. A vacuum excavation was also performed during the construction, from which they could confirm the accuracy of the collected GPR data. Develop and conduct an major expansion on an historic campus. As the ground had a 170-year old history the knowledge about the ground was limited. A preliminary drawing from the architectural company revealed some objects, but the ground was suspected to hide numerous undocumented utilities. For the SUE-investigation the GPR-method was used. 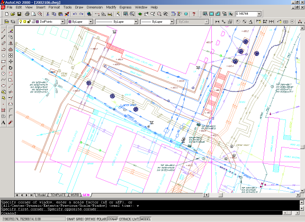 During the GPR scan they designated an important utility line – A stream line that later turned out to have been misrepresented on the ground drawings by 10-feet. But once the exact location was revealed the line could be located with vacuum excavation. The misrepresentation of the stream line could have been costly. They discovered that the foundation of the proposed building would have fallen over the actual location of the line. A typical action when encountering unexpected utilities like these is to relocate the line rather than re-engineering the entire building. An estimated cost from a contractor to re-locating a streamline is up to $640.000. A cost for a SUE project is between 1-$56,000.